There is a depth of humanity in these songs that connects us to a not-so-distant past. Albion Records – a wing of the Vaughan Williams Society – have a shining track record in its RVW coverage. They continue to satisfy the composer’s enthusiastic constituency and beyond. Albion does not shrink from the most abstruse corners of the heritage and this disc finds them delving among vintage discs of folksongs and folk-related material. Only 13 of the 25 tracks are VW arrangements. The remainder are arrangements by other British composers; there’s one which is the handiwork of Fritz Kreisler. All were commercially issued during a 25-year period from 1919. The mono sound has been cleanly, kindly and professionally refurbished by Peter Reynolds…. 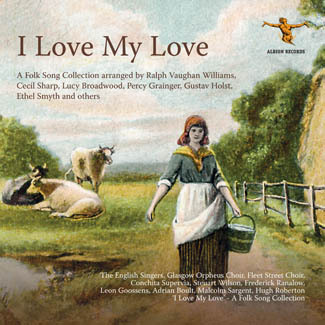 I Love my Love is a collection of remastered 78 rpm recordings of folk songs, drawn from recordings made between 1919 and 1947. It focuses on folk songs of classical beauty, presented in generally straightforward arrangements, collected in the early years of the 20th century. There is a depth of humanity in these songs that connects us to a not-so-distant past. The stories and sentiments they describe, of love, war, courtship, separation and the vagaries of the seasons, can make us smile, empathise and, sometimes, still move us to tears. In parallel with the collection and revival of folk song at the beginning of the 20th century, there was a revival in Tudor music, as a result of which E H Fellowes completed 36 volumes of The English Madrigal School in 1913, and finally got it published in 1924. Steuart Wilson and Cuthbert Kelly founded The English Singers to sing this repertoire, and they adopted the quasi-Elizabethan practice of sitting round a table to sing. Clearly, they were happy to extend their repertoire to folk song, and the first ten tracks on our new recording find them singing folk song settings by Vaughan Williams. The next three tracks feature Steuart Wilson himself, with Gerald Moore. Further settings by Vaughan Williams appear in various guises, with some beautiful arrangements by other composers. All true RVW lovers will want to hear Mary Lewis in “I’m to be married on a Tuesday morning”. Performers: The English Singers, Steuart Wilson, Gerald Moore, Frederick Ranalow, Conchita Supervia, and others.